At age 28, Evan Favaro, the owner, operator, designer and builder of Speakeasy Motors, has achieved a lot in the past few years. It all started when he was 12 years old, building small custom 2 stroke race motors from scratch for himself and his friends to race around town with. This started a passion fueled by the desire to be different than every other kid around him. Instead of video games, he bought himself a welder when he was only 14, welded a chain into a steering wheel for a go kart he built with his friend, and the rest is history. At 15 he built his first mini-chopper from scratch, follow by another. These two "minis" greatly limited by a young teenagers budget, acted as a resume at a local motorcycle shop. 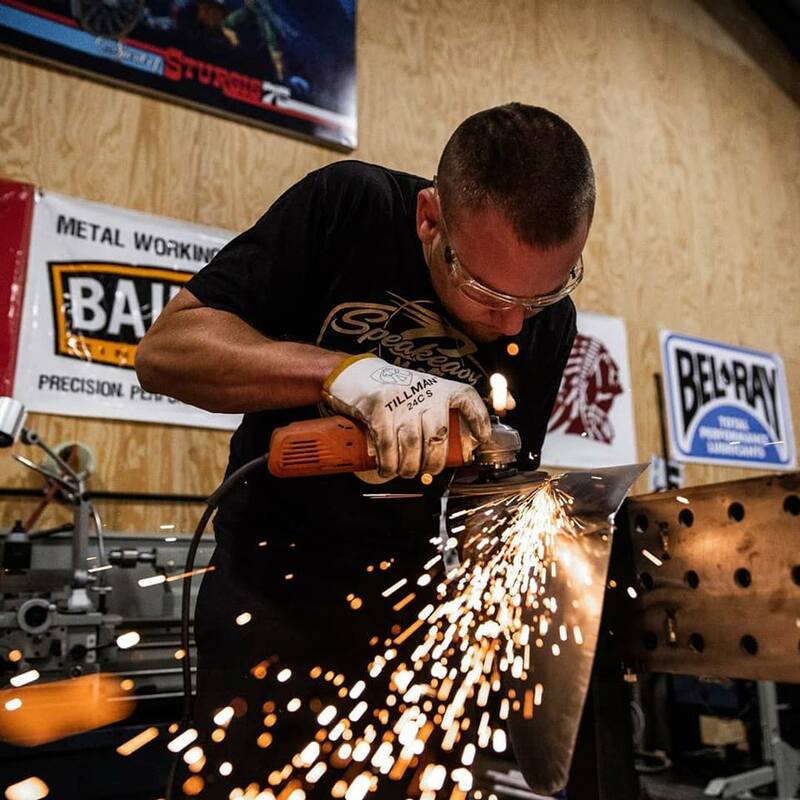 Starting an apprenticeship there at 17 and working full time during high school, Evan learned the basics about motorcycles from basic mechanical work to some custom sheet metal fabrication, machining, and welding. Quickly climbing to the top, it was time to start building himself a custom street bike. From a free barn find '72 Honda CB350, the "Crap Weezel" emerged. On a small budget, this rat bike was the first of many custom motorcycles he hammered out from scratch there, some on a tight $2,000 budget, and some worth over $80,000. The Crap Weezel took 2nd place in a bike show during Laconia Bike Week against dozens of high-end choppers, plus a couple magazine features and articles. Through the shop he worked at for over 4 years, Evan traveled up and down the east coast doing bike shows and events, showing the work that was featured in dozens of magazines, even overseas, numerous TV features, and won many Best in Show and Best in Class awards. Evan then decided that it was time to open his own shop. Opened in April of 2011,Speakeasy Motors is the next generation of custom motorcycles and hot rods. Progressing very quickly in a short amount of time the shop exploded. Over the next few years, Evan continued his education by taking specialized seminars with the best of the best, Fay Butler. Fay is a world renowned metal shaped, and people travel all over the world to learn with him, including Jesse James. Evan and Fay have a continuously growing relationship, and a few times a year he works with Fay and teaches High School Tech/ Shop classes on the basic fundamentals of welding, metal shaping, and the science of Metallurgy. If you Google his name, you may find that he is also used to be a metal fabricator at a world famous custom motorcycle shop. Hot rods are also welcome, since they are also another one of Evan's biggest passions. Some to keep, some to sell, his collection has included everything from a '38 chopped/channeled/suicide Buick, '50 Chevy pickup rat rod, '68 Ford Fairlane, ’66 Dodge A100, ‘31 Model A, ’54 Ford F100,a '78 Ford dump truck, ‘26 Model T Speedster, a ’31 Desoto, and even a pontoon boat built totally from scratch out of 55 gallon drums to name a few...Plus about a dozen motorcycles...but who's counting.